Our Premium Grade Organic Cinnamon Powder has been ground from cinnamon bark in South India, from the true cinnamon variety of cinnamomum verum aka zeylanicum but more commonly known as Ceylon. Note: We do not use Cassia Cinnamon. Cinnamon is high in minerals and is one of the most powerful sources of antioxidants in the world. This may explain why it has been used for centuries in the ancient near east for its medicinal purposes. It can be used as a digestive aid and to stabilise blood sugar. More recently studies such as Gruenwald et al, 2010 have shown cinnamon to have many health suporting properties. A 100g pack can flavour up to 5kg of most of our Protein Powders, however if you want a stronger taste you may want use more. And if you want it to taste sweet, dont forget to add a natural sweetener such as our Organic Stevia Extract. Add 1g of Organic Cinnamon Powder to a protein shake or your favourite recipe. Taste gr8. You only need 1/4 of teaspoon in your smoothie. Highly economical. Mix with protein powder along with bananas & walnuts. Hello breakfast! I have been using this product for a few years and find it to be most effective as an anti inflammatory. It is of good quality and delivery is always on time. You can leave any small jars of cinnamon from the grocery chains on the shelf. This product is fresh and delightfully flavoured. I use it in my shakes and in any cooking that requires cinnamon. Top product! Supurb quality organic ground cinnamon, keeps the same amazing fresh, sweet taste until the end of the packet (which lasts quite a while!) In fact, I think it just keeps getting better! I've be enjoying this organic ceylon cinnamon for a few weeks so far and truly love it. I probably need to wait a bit longer before checking my cholesterol levels but I'm hopeful. I use some in my coffees and morning smoothies - yum! I threw my supermarket bought cinnamon away and will only use this one. I've also given a pack to my sister. She uses it too now. Thanks for providing me with this beautiful product. I love this cinnamon powder; I mix a heaped teaspoon with my protein powder every day. One day I accidentally used a shop bought powder and it wasn't nearly as nice. As a bonus, I found that it lowered my fasting blood sugar levels from around 5.6 to 4.5. This Cinnamon tastes rich and great,we enjoy having our Honey and Cinnamon drink every night/morning. 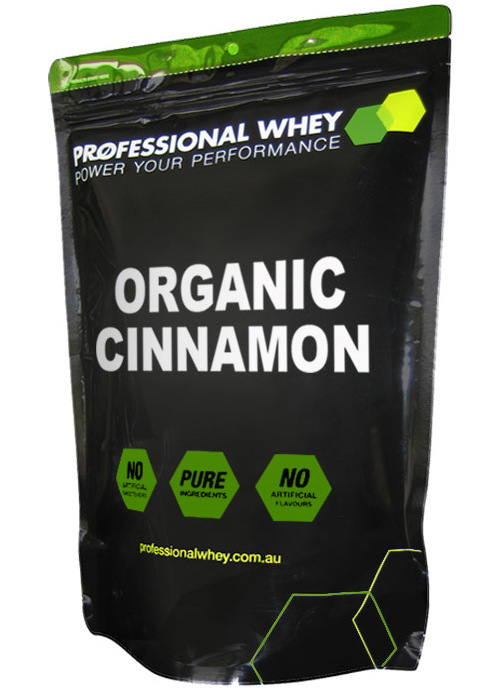 I was delighted to find this organic cinnamon as I already use the grass fed whey protein powder and add the organic vanilla from PW myself, I now add this too as part of my morning anti inflammatory routine. Many thanks for the top choices!! Best tasting cinnamon product out there - I use it in my smoothies, put it on quinoa and other cooking. Has a far superior taste than what you can buy at the supermarkets. This product tastes great. Thank you for an excellent shopping experience and a terrific product. I make Paleo Cinnamon Buns, and with this Top of the range organic cinnamon they are just to die for. The cinnamon tastes sooooo good!!!!! I mix this in with my Cacao. Great taste. Great quality organic cinnamon. I typically use cinnamon in two of my meals per day, so I appreciate a product that has a more refined taste than what you'd get in a shaker from the supermarket. A little goes a long way! We've been using this product for some time now - definitely the best quality cinnamon available. I'm a big fan of cinnamon, and so I had high expectations of this product - it doesn't disappoint. 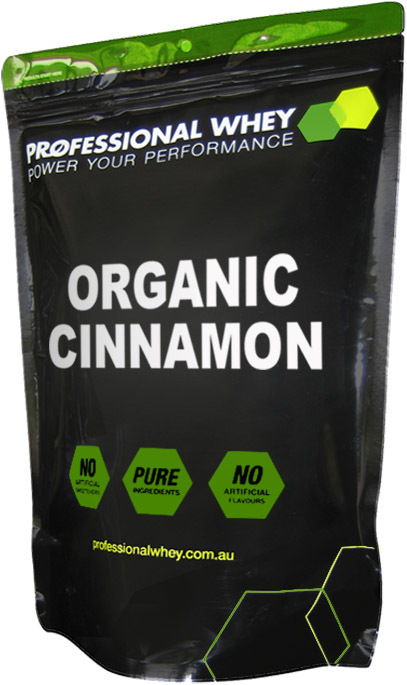 The cinnamon tastes amazing, is good value and is the perfect addition to protein shakes and cooking in general. It’s a really delicious, healthy spice. It was delivered quickly as well – bonus points! I can highly recommend this product. Tastes great. You don't need too much otherwise it can really give you a bit of a kick. I like to mix it with some cocoa powder when I have my protein drinks just for the mix of health benefits. Tastes great with rolled oats. One thing I have found is it doesn't dissolve well with protein drinks. Tastes great and easy to use. Will buy again. Great tasting product , once again , thanks to you guys for a great product and service !!! Taste, packaging and prompt service - all impressive. Really great product. Easy to use. Tastes great. Fantastic product. Tastes great with the egg protein! Another quality product from Professional Whey! Simply the best cinnamon powder I have ever tried - what more can I say?